It’s funny to hear people’s thoughts on Transylvania: many people imagine it as the spooky land of Dracula, a region covered in a perpetual eerie mist and darkness. I gotta say that they’ve got it ALL wrong. 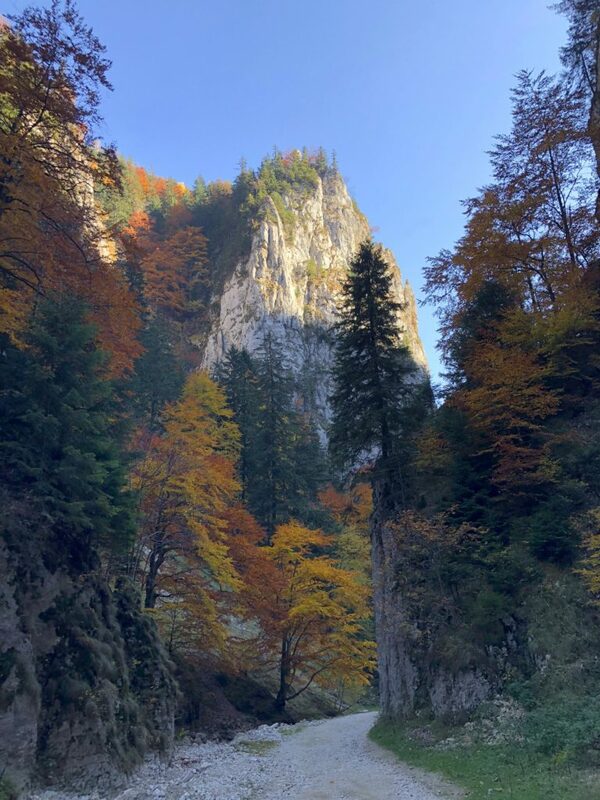 This picturesque mountainous region is my favorite in Romania, the country I’ve called home since February 2018. 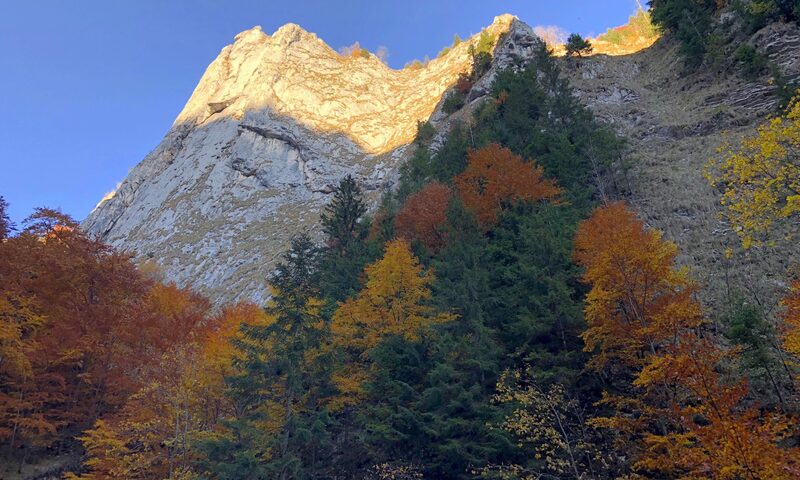 Transylvania is actually a wonderland in the fall: reds, oranges, golds, and yellows stretch across the countryside as far as the eye can see. 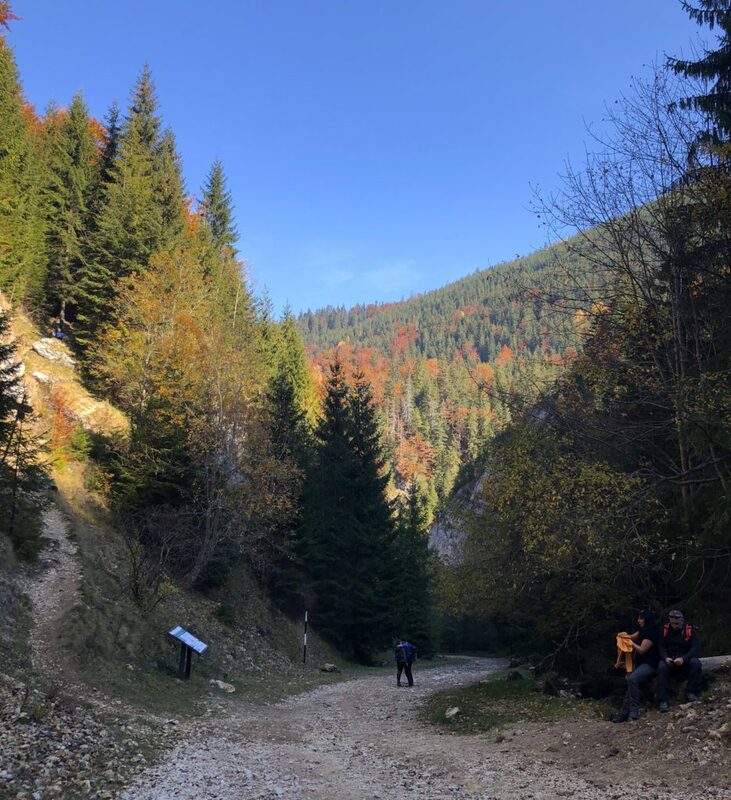 If you’re a big fall fan like me, this scenic and easy hike in Piatra Craiului National Park, located in southern Transylvania, is just what you’re looking for. 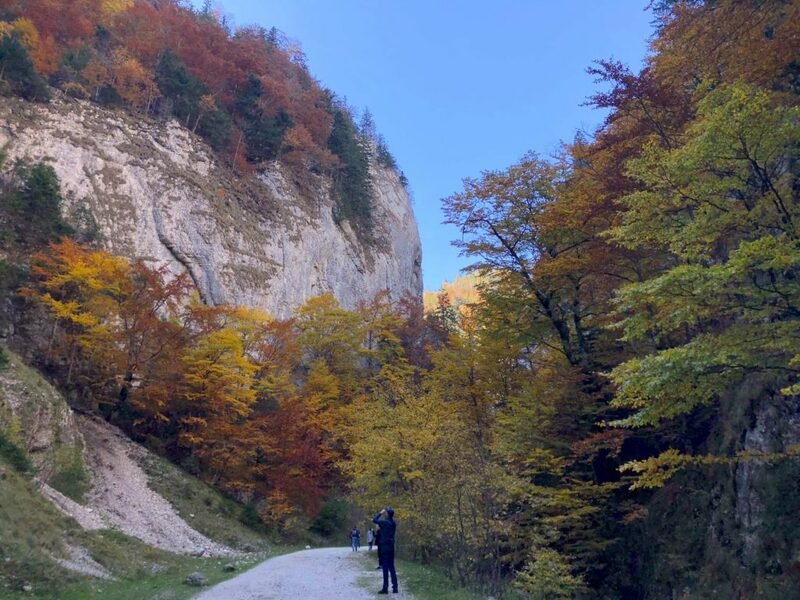 This post is dedicated to my leaf-peepers and chill hikers out there searching for some guidance (I literally Googled “easy hike in Piatra Craiului National Park” before visiting and didn’t find many specifics, so hopefully this will help somebody out). 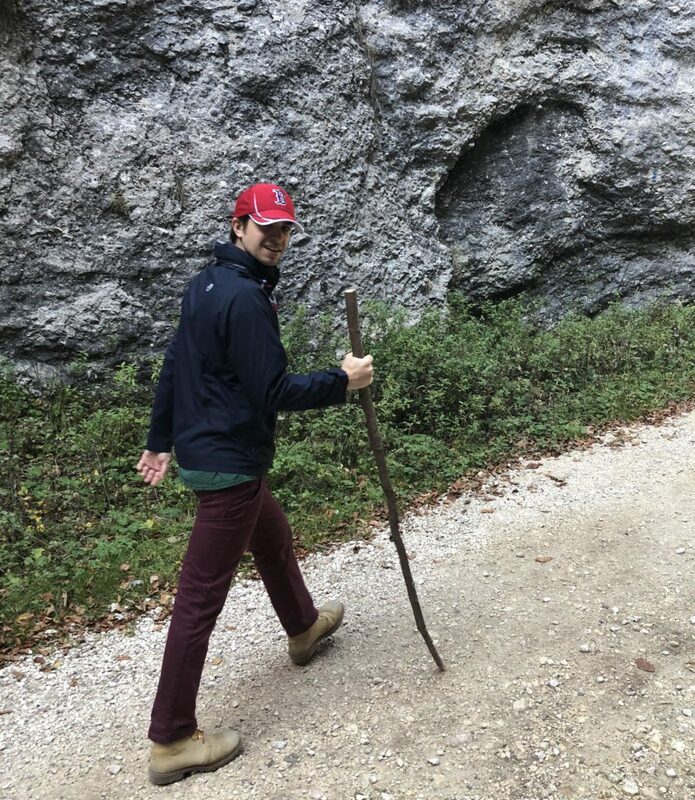 Below I answer a few questions to help you plan for this awesome hike. 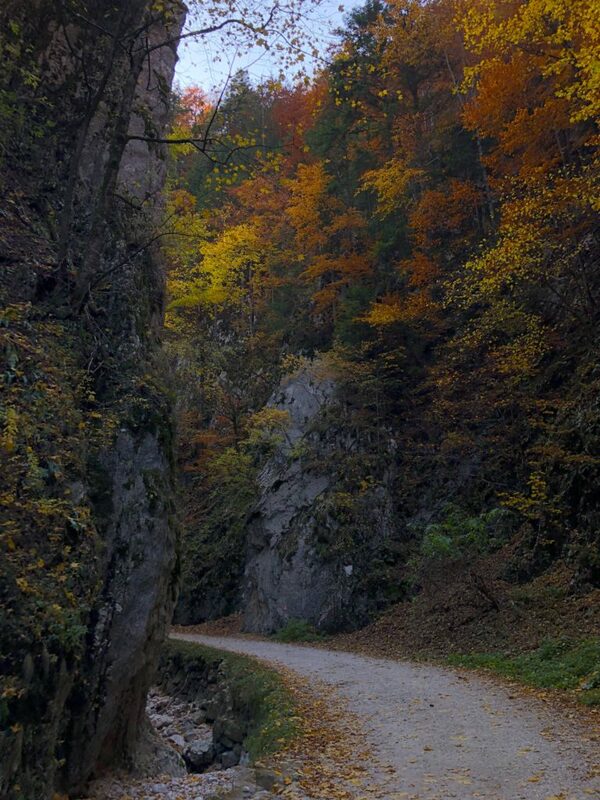 Piatra Craiului National Park is located in southern Transylvania. It’s a popular place for hiking with a wide range of trails of varying difficulty. The park is about a three to four-hour drive from Bucharest (where I live) and less than a one-hour drive from Brasov. Yeah, you may think that a four-hour drive seems long (and it can be on Romanian roads), but it’s also stunning. When we went, the hills were alive with the colors of fall, so this drive was a great start to the trip. How can I access the park? Is there a visitor center? There are a few entrances to the park (see the park’s website here for all access points), but we accessed it through the town of Zărnești, the park’s main entrance. Although the park’s visitor center is on 150 Toplita Street as per their website, we (accidentally) stopped at another tourist information center in the heart of Zărnești, located here. This tourist center looked legit – it has the official logo of Romania tourism and offers info on a variety of activities, including but not limited to Piatra Craiului National Park, so this may be a good stop if you’re interested in other activities in the region. 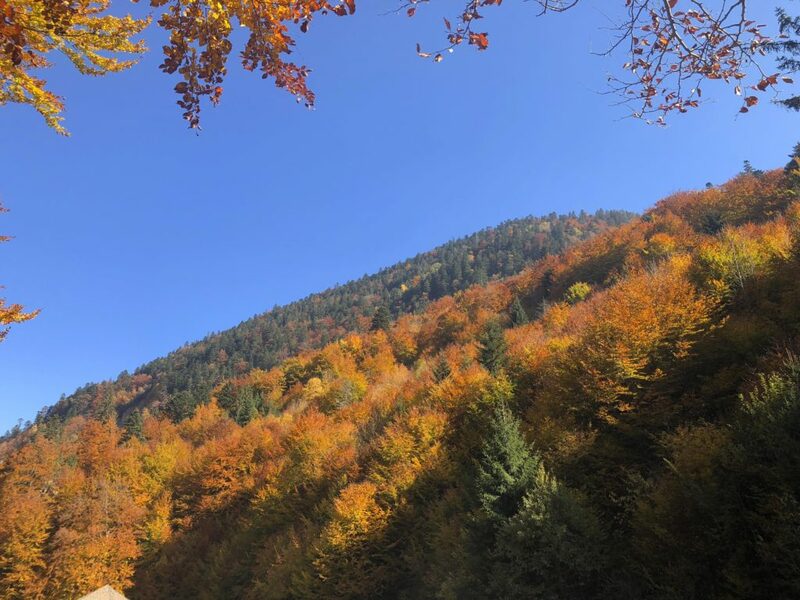 The helpful woman here spoke English and answered all of our questions about hikes, like how long certain trails would take, where they led, and, of course, whether we’d peep some great #foliage or not. I’m kinda short on time and don’t want an intense full-day trek. What trail should I pick? In response to our request for a relatively short hike, the woman at the visitor center recommended doing part of the blue-stripe trail. To access the trail, we drove a few minutes to the Fountain Botorog, where we parked the car for free (oddly, we were not asked to pay to enter the park at any point…). From there, we walked about 15 minutes to the actual start of the trail. Not gonna lie – we briefly got lost at this point, lol. 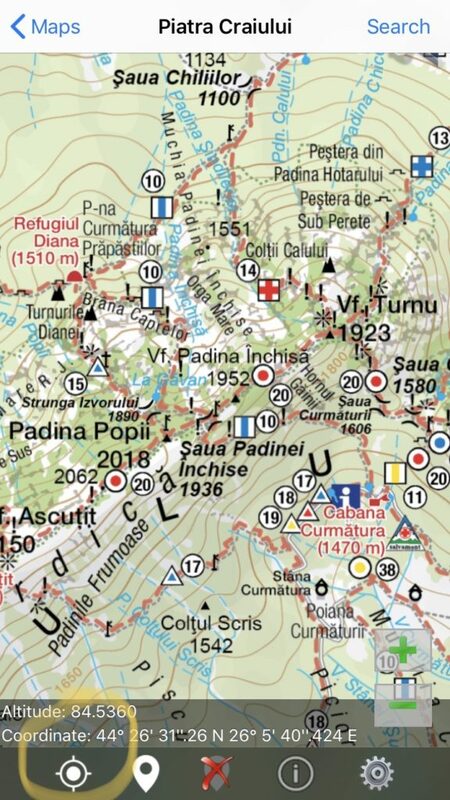 What helped us get back on track was the app Munţii Noştri, which has maps of several mountain regions in Romania. We downloaded the map for Piatra Craiului before arriving. 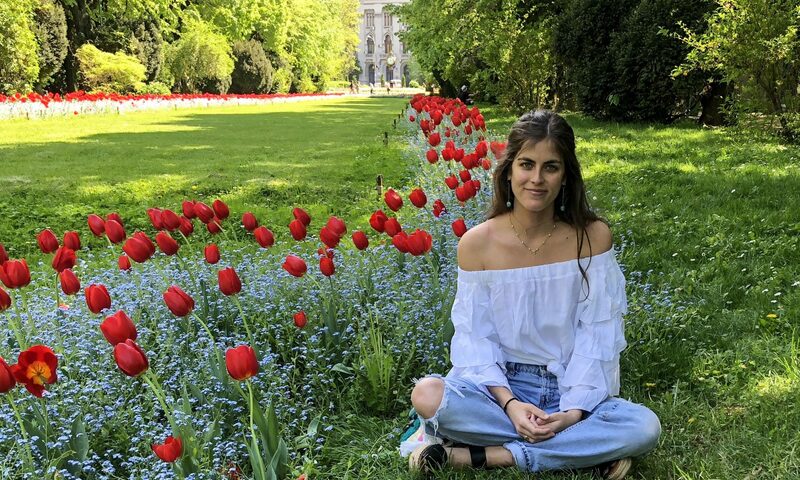 The app was particularly useful because of its GPS feature, which told us exactly where we were on a map of the park, trails and all – the kind of info Google maps wouldn’t have. Thanks to the app, we got reoriented and headed back toward the trail. We spent about 2 hours on the trail itself: 1 hour up and 1 hour back down on the same path. You’ll know when to turn around because the signs for the blue-stripe trail continue up a steep, narrow path, which we chose not to do (see the pic below). So, in summary, we spent about 2.5 hours in the park from getting out of the car to getting back in. 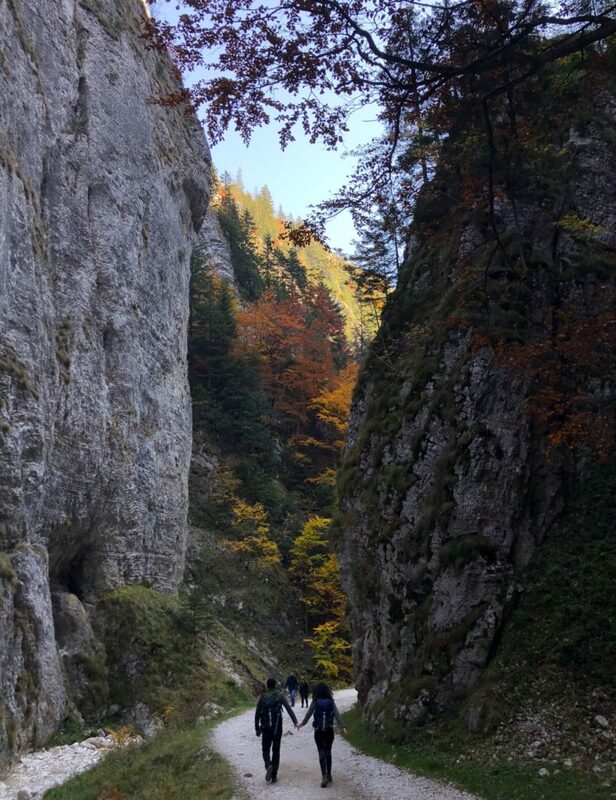 Overall, this trail ended up being the perfect choice for an easy hike in Piatra Craiului National Park. A screenshot of the Munţii Noştri app. In the bottom left corner is the GPS feature that gives your location on the map. Note the blue-stripe trail that we did. Saw great foliage on the way to the trail! I’m not trying to rock climb a 90-degree precipice either. How difficult is this trail? Not difficult. 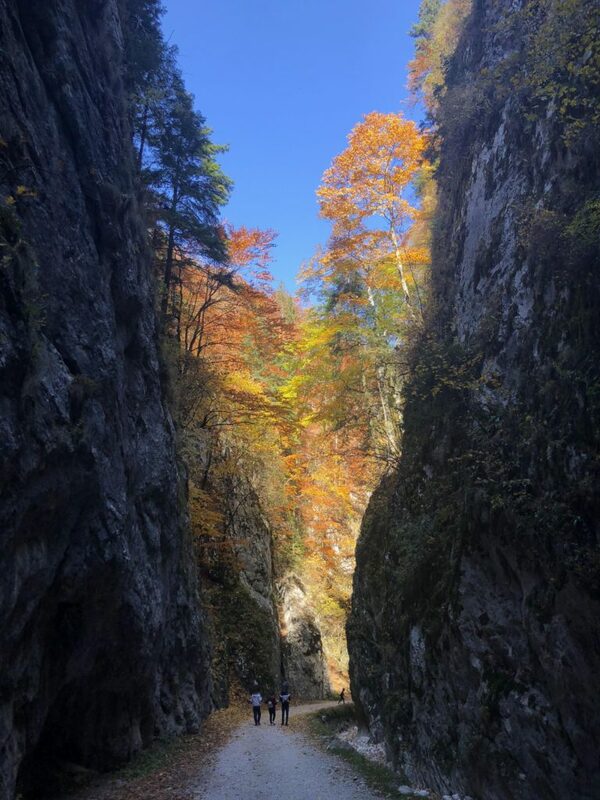 (This post is titled an easy hike in Piatra Craiului National Park, after all). The “hardest” parts of the hike are gentle slopes: oftentimes, it just feels like an active stroll. We even saw elderly people along the way! Ok, so what makes this trail so scenic? The really unique part of the blue-stripe trail is that it winds through a canyon. 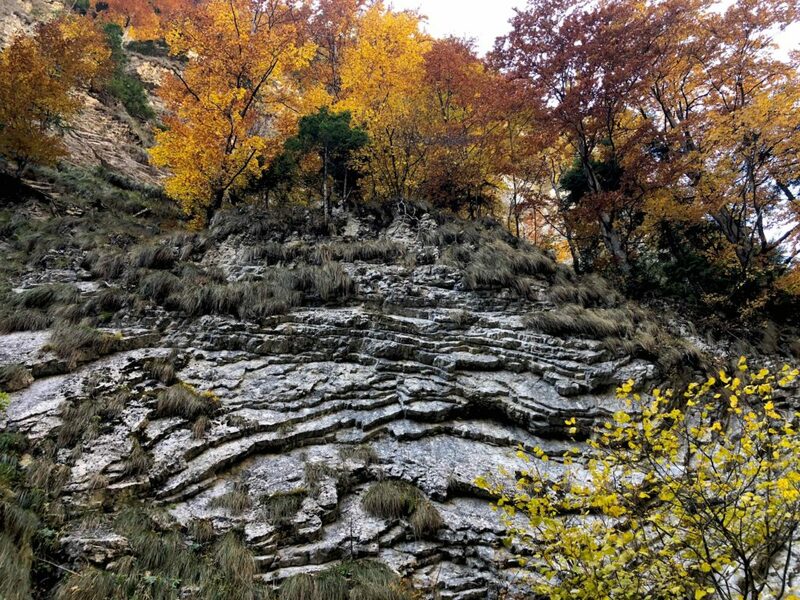 On either side of the narrow trail, there is a huge limestone rock formation. The cherry on top is the amazing foliage: all along the canyon, there are red, orange, and yellow trees aflame with autumn beauty. As an admitted fall foliage freak, I was in heaven. The amazing rock formations on the blue-stripe trail! Just takin’ a lil’ stroll! I’m a big fan of autumn leaves. What time should I do this hike for ideal foliage? We went in mid-October – specifically October 13, 2018. 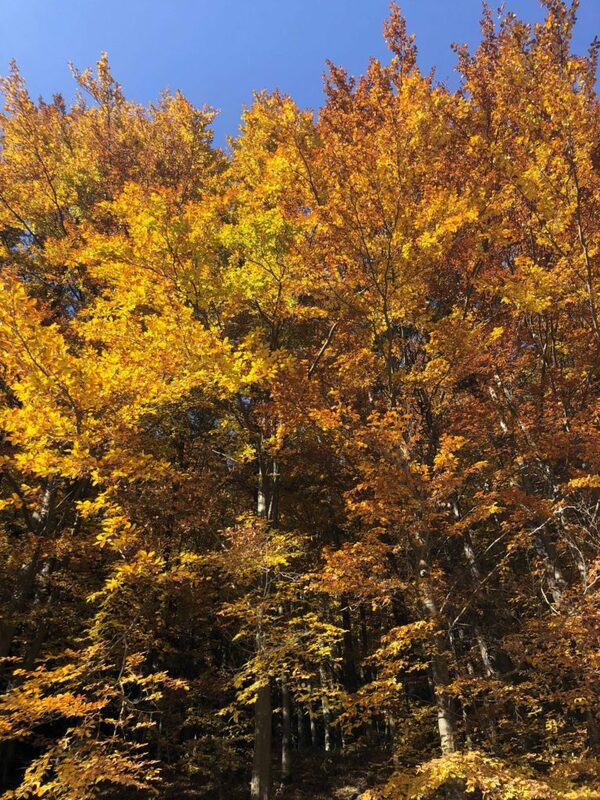 We got really lucky because this seemed like the PERFECT weekend for leaf-peeping. I felt like the weekend before would not have been as colorful and that the following weekend would start to be more bare. Based on my research and personal experience, I’d definitely say that mid-October is your best bet. This seems like a great weekend excursion. Where should I stay? 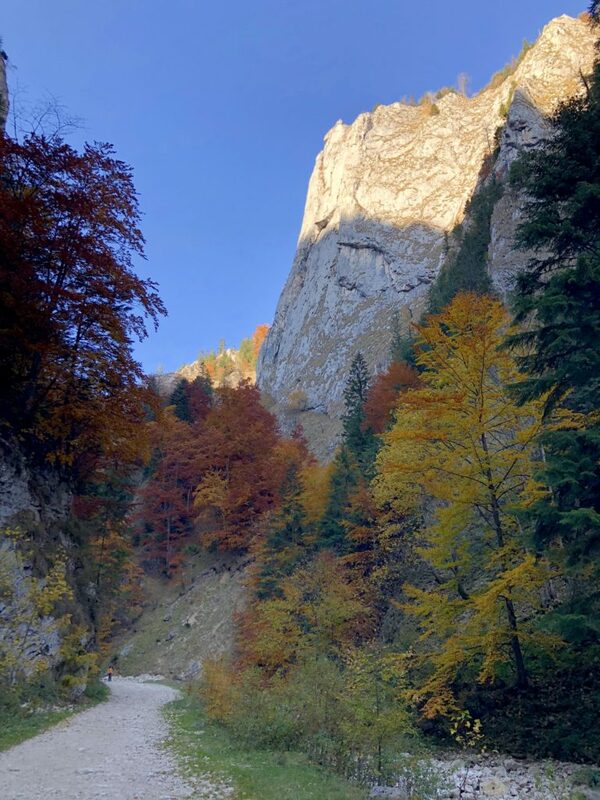 This pleasant, easy hike in Piatra Craiului National Park makes for an ideal weekend adventure. I definitely recommend staying in Brasov, less than an hour drive from the park and a perfect retreat after hiking. The small town of Zărnești doesn’t seem to have much going on, so I wouldn’t recommend staying there. For more info about where to try the best Hungarian wine or where to indulge in delicious risotto in Brasov, check out my post for where to eat here. Mt. 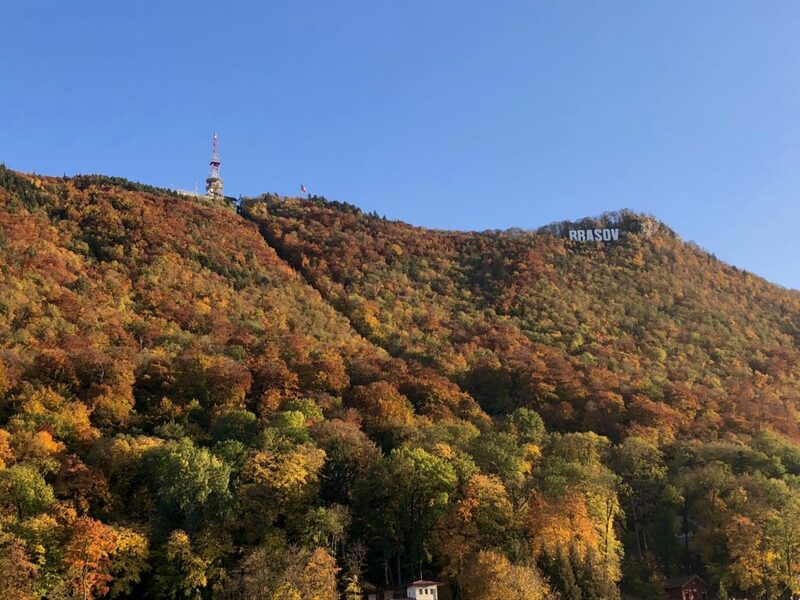 Tampa in Brasov in the fall – spectacular! 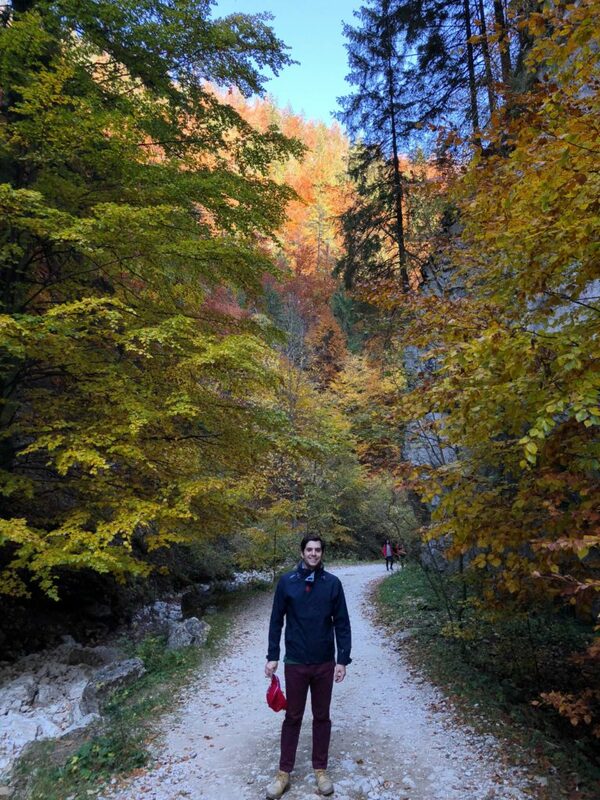 I hope you enjoy this easy hike in Piatra Craiului National Park!